In today’s digital economy, logistics networks face many different challenges. Logistics processes have to be cost-efficient, meet tight delivery deadlines, and flexibly adjust to changing demands. Together with multiple partners, itelligence has launched an innovation project – named Smart Carrier – that aims to provide solutions for future data-driven logistics challenges. Logistics is transforming. Major global carriers such as DHL, FedEx, and UPS have already implemented different kinds of digital asset tracking or innovative delivery solutions. Now they are exploring new concepts like same-day delivery, car-trunk delivery, and drone delivery. But there are also new players disrupting the market, such as Flexport, Frachtraum, and Cargonexx. These platforms are challenging existing carriers by creating new digital services without even owning real vehicles or transportation facilities. They also support the digitization of smaller carriers by offering innovative IT solutions. The diverse nature of these carriers is one of the main challenges when it comes to integrating smart logistics processes with conventional business processes. Nowadays, any asset, vehicle, or package can be connected to the internet, which enables new data-driven delivery concepts. One example is real-time temperature monitoring in the pharmaceuticals industry, where it is crucial to protect temperature-sensitive drugs and vaccines during shipment. Or in the manufacturing industry, where GPS-based asset tracking is used between different production locations to enable just-in-time assembly and ensure real-time supply chain processes. These kinds of scenarios are driven by data from the Internet of Things (IoT), sensors, geolocation data, parcel and delivery data, or even contextual data, such as weather conditions. In 2007, itelligence started to integrate several carriers into core SAP business processes with its solution it.x-press, which is now celebrating its 10th anniversary and has become well-established in the industry. Using a diverse range of application programming interfaces (APIs) and EDI interfaces from around 100 carriers, it.x-press has become a comprehensive framework for delivery management and parcel tracking directly within SAP systems. The itelligence solution brings customers the benefits of using different carriers and their services in one single system. This means they can manage the entire business process within their SAP ERP system and handle deliveries involving external logistics companies. At present, over 180 businesses are using it.x-press. Extending this solution with newly available data from the IoT will bring new opportunities for enterprises and pave the way to a digital transformation of logistics processes. In 2016, itelligence initiated a joint innovation project called Smart Carrier, working with several industry partners and research organizations. 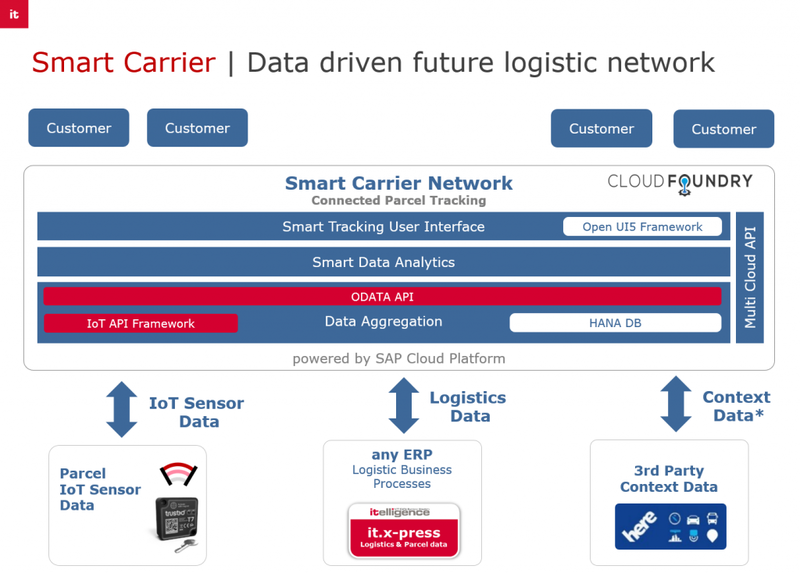 Funded by NTT Data, the project aims to shape the data-driven future of logistics. The idea is to combine existing silos of IoT sensor data, package data, and delivery data provided by the core it.x-press solution and then complement them with additional contextual geolocation data. One of the first project goals is to demonstrate how different data providers with logistics information can easily be integrated in a multi-cloud platform to provide an open API for this newly aggregated data to other platform participants. A new Tracking Cockpit extends the current features of it.x-press with track & trace functionality and real-time IoT sensor data. The open solution uses the widely adopted Cloud Foundry platform and open UI elements. Furthermore, it enables additional features based on machine learning for intelligent routing and blockchain-based technology for smart contracts. By collaborating with multiple partners and combining their expertise to shape a new cloud-based solution, itelligence will meet rising customer demands concerning global reach, real-time tracking and monitoring, and end-to-end business integration into the SAP ecosystem. At the itelligence World 2017 conference, a prototype of the Smart Carrier solution will be presented live on stage by the experts. We are happy to have all contributing partners at the conference to extend our collaboration with customers and suppliers.